Sharp injury definition: an incident, which causes a needle, blade (such as scalpel) or other medical instruments to penetrate the skin. This is sometimes called a percutaneous injury. OSHA reports that nearly 55% of all percutaneous injuries are caused by hollow bore needles including phlebotomy needles. Global Annual Impact and Risk: The World Health Organization estimates that there are over 35 million health care workers globally. These workers face an increased risk of infection from blood-borne pathogens simply because of their exposure to blood and other body fluids. This risk increases substantially for the tens of thousands of health care workers who experience a sharps-related injury. 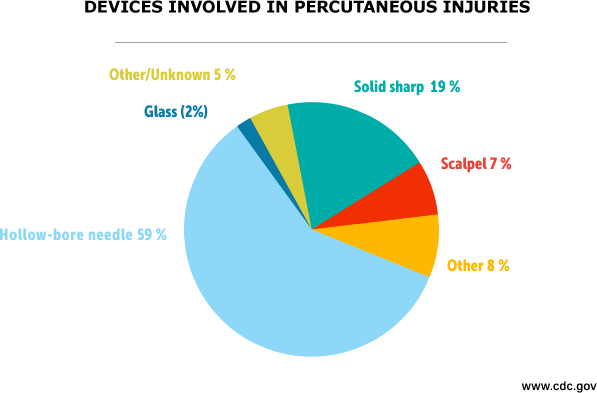 These injuries are associated with the highest risk of disease transmission. Globally, the sharps injury rates vary dramatically-between 0.2 and 4.7 sharps injuries per year. At the same time, there is a stark difference in infections rates attributable to sharps injuries based on location in a developed or undeveloped country. Regions where programs have been put in place to reduce and treat sharps injuries have successfully reduced both exposure rates and infections rates, protecting their health care workers.